I hear others say things like ‘why me?’ and I’m somewhat surprised that I have yet to have that feeling. Perhaps it is a bit of denial, but also I wonder if it is related to my outlook on life. I’m not a theist (I don’t believe in a god). I see the world as some form of random chance. I do believe some things happen for a reason. I believe that my past has prepared me for the challenges the lie ahead. I remember lying in bed chatting with my husband about the possibility of cancer – before it was diagnosed – and saying ‘it is what it is’ – we will deal with it. There has yet to be the ‘why me’ feeling. Perhaps by not believing in a god, I don’t have anyone to ask the question to? Now I’m not an anti-spiritual person. I’m an Unitarian Universalist. I find peace in nature, so today we spent some time communing with nature. We went for a walk in the Redwoods up at Big Basin Redwoods State park. We walked for 9km – according to my Runkeeper app, that’s a record for me. Big Basin Redwoods is perhaps one of my favourite places. The trees are literally 1000s of years old. There is a peace when you are walking and touching these ancient trees – some with battle scares from fires long past. They are survivors. We stopped for about half an hour to sit an a bridge over a dribbling creek. 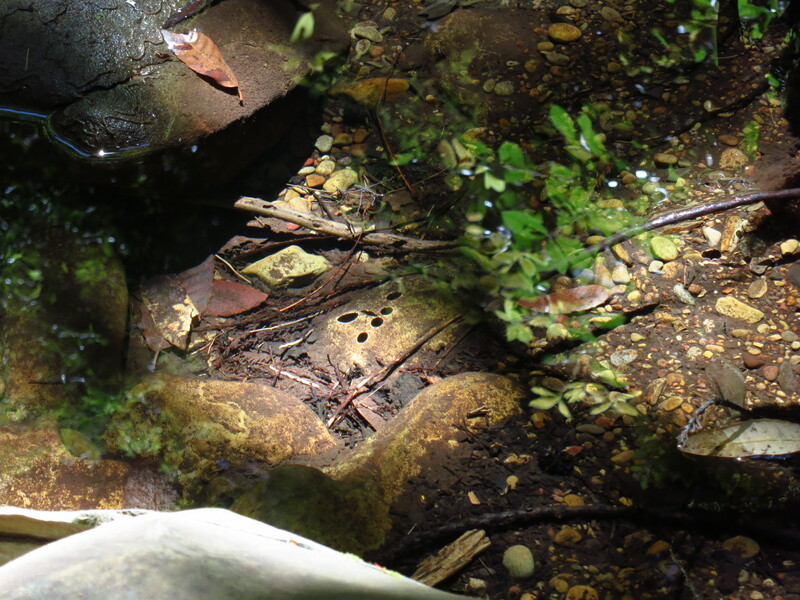 We noticed these water bugs that created the most fascinating shadows on the bottom – like moving black dots. Scott has some theory about their feet acting as magnifying glasses, causing there to be no lighting center and a glow outside. You can see it in the center of the picture below. It is amazing what you see when you slow down for a few minutes and just be. Quite fascinating. Love you. Love your day, you two. I personally don’t believe that anything happens for a reason. But I believe that we are powerful and capable of finding meaning in whatever randomness occurs. Which pretty much amounts to the same thing. Thanks for taking us along on your journey. Have a lovely day.